At Karam Immigration Law, we work with individuals, families, and companies to help people who are beneficiaries of DACA, TPS, and other special immigration programs. We handle complex cases and challenging immigration matters and work to find creative solutions to help our clients obtain and renew work authorization or legal status. If you are looking for a Houston Lawyer for TPS and DACA help, click the orange button below to schedule a consultation with us. Immigration Law and policy are often subject to changes made by officials of the Executive Branch of government. TPS and DACA are two examples of the Executive Branch having authority to change things that affect immigrants in the United States. Authority to designate countries for TPS or to decline to re-designate them has been granted to the Secretary of Homeland Security. This means that countries designated for TPS may change from administration to administration. Over the last two years, the Trump administration has sought to end TPS programs for several countries. For example, TPS for Liberia, Guinea, and Sierra Leone ended in May 2017. The Trump administration also announced that it would end TPS for citizens of Honduras, El Salvador, Nicaragua, Haiti, Sudan, and Nepal, but there is a pending lawsuit on this decision, so it is unclear what will ultimately happen to people from these countries who have TPS. Right now, people from Honduras, El Savlador, Nicaragua, Haiti, Sudan and Nepal may still renew their TPS and apply for advance parole travel documents if needed. You may find this blog helpful: Can I Apply for a Green Card if I Have TPS? 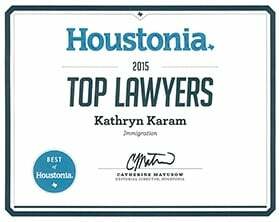 If you need advice about your TPS status, call Karam Immigration Law today at (832) 582-0620 to set up a consultation. Karam Immigration Law assists people seeking assistance with their TPS applications in the Houston area, including Sugar Land, Alief, Sharpstown, Bellaire, Spring Branch, The Woodlands, Clear Lake, League City, Kingwood, Cypress or Tomball. In 2012, President Barack Obama announced that he was creating DACA as a form of prosecutorial discretion - it would serve as a way for undocumented immigrants who came to the United States as minors to apply for protection from deportation. The constitutionality of the DACA program has been widely debated and several lawsuits have been filed to stop the DACA program or prevent the government from ending it. Regardless of our views on the Constitutionality of a program like this which was announced and implemented by the executive branch of our government, many agree that we need a solution for undocumented immigrants who were brought to the United States as minors. Since it is unclear whether the DACA program will continue and if Congress will pass a long-term solution for “Dreamers”, it’s important for people with DACA to understand their options. If you have TPS or DACA or had approval for either of these programs in the past , know your options. Talk to a specialized attorney about your situation so you can find out if you qualify to apply for immigration status based on one of the options above.